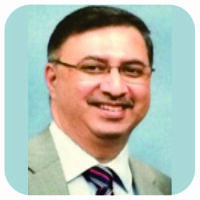 Department of Orthopaedics, Jaslok Hospital, Mumbai, Maharashtra, India. 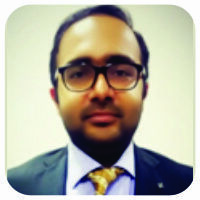 Department of Orthopaedics, Jaslok Hospital, Mumbai – 400026, Maharashtra, India. Introduction: Oral bisphosphonates are commonly prescribed for osteoporosis to arrest bone loss and preserve bone density. Complications such as atypical femoral fractures (AFF) and osteonecrosis of jaw (ONJ) are rare. Case Report: We describe a case of a 60-year-old patient who was on oral bisphosphonate therapy for osteoporosis and developed ONJ, AFF, recurrent ONJ, and subsequent mandible fracture with delayed AFF union – this is a very unique and extremely rare case. For the same, she underwent multiple surgeries – sequestrectomy in the mandible, proximal femoral nailing for femur fracture and plate fixation for her jaw. The delayed union needed teriparatide administration. At 1 year follow-up, the patient had a complete radiological union for AFF and on recent follow-up the patient is asymptomatic as regards the femur as well as the jaw. This unique sequence of events has not been described previously. Conclusion: This case report shows the possibility of extremely rare adverse effects happening sequentially in the same patient with long-term oral bisphosphonate therapy. Patients need to be informed and monitored regularly for symptoms such as jaw pain and thigh pain and if these occur, the drug must be stopped immediately, and other alternative medical treatment for the osteoporosis should be started. Keywords: Alendronate, bisphosphonates, atypical femoral fracture, osteonecrosis of jaw, mandibular fracture. Oral bisphosphonates are commonly prescribed for osteoporotic patients to arrest bone loss and preserve bone density. 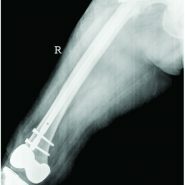 Although short-term efficacy and safety of these drugs have been investigated and documented, an increasing number of recent reports have draw attention to the correlation of long-term bisphosphonate therapy and development of atypical femoral fractures (AFF)  in some patients and osteonecrosis of jaw (ONJ) in others, though their incidence is rare and the incidence of both the complications occurring together in a single patient is very rare. We experienced an extremely rare case of ONJ followed by AFF and recurrent ONJ and subsequent mandible fracture with delayed fracture union in a patient who was treated with long-term oral bisphosphonate administration for osteoporosis. A 60-year-old female known case of hypertension and diabetes on treatment had undergone bilateral total knee replacement in 2002. The patient was treated with oral bisphosphonate therapy for osteoporosis, 70mg alendronate once a week orally from 2003 to 2007 (4 years) and then from 2009 to 2013 (4 years). The patient presented to the hospital in January 2013 with pain in the right side of the jaw and pain during mastication since 6 months. From her history, clinical examination and radiological findings she was diagnosed to have osteonecrosis of her right posterior body mandible (Fig. 1). This was treated by way of sequestrectomy and saucerization in January 2013 (Fig. 2) and stoppage of Alendronate. There was no history of the patient having any dental procedure while on alendronate. In March 2013, she was admitted with complaints of pain and swelling over the right thigh following a history of trivial fall, and after clinical examination and history taking, X-rays were done which showed an atypical right displaced subtrochanteric fracture through the focally thickened lateral cortex of proximal femur (Fig. 3). The fracture was managed surgically with proximal femoral nailing (Fig. 4). The knee replacement was unrelated to the sub-trochanteric fracture. 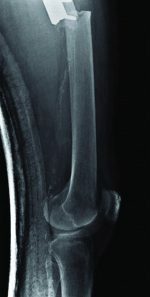 For the subtrochanteric fracture of femur, regular follow-ups were done postoperatively with serial X-rays. Blood investigations were done, and serum calcium was 9.5mg/dl, and serum Vitamin D3 was 20ng/ml which was optimized with 6,00,000 IU of intramuscular Vitamin D3 and maintained by oral Vitamin D3 medications. At 3 months, the fracture was in delayed union (Fig. 5),and hence, the patient was started on injection Teriparatide 20mcg subcutaneous for a period of 18 months. The patient was kept non-weight bearing. 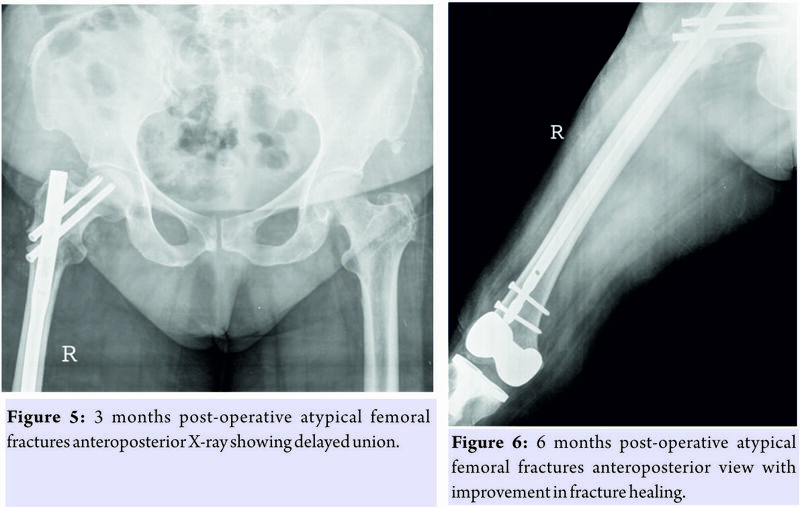 The 6 months X-ray showed further progression in fracture healing (Fig. 6),and the patient was allowed partial weight bearing. In October 2013, 10 months after stopping Alendronate, she again came with the complaint of pain in the right side of the jaw; X-rays showed relapse of ONJ (Fig. 7) sequestrectomy was done on the right mandible. In February 2014, 13 months after stopping Alendronate, the patient came with the increased pain of the right mandible and was diagnosed as a fracture of the right mandible; the fracture was operated on and fixed with a plate in February 2014 (Fig.8). Meanwhile, the patient continued injection Teriparatide. 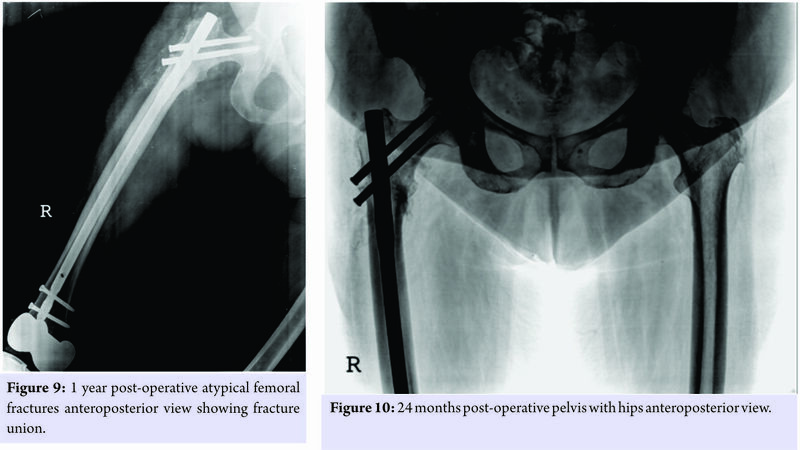 At 1year postoperatively, the atypical femoral subtrochanteric fracture had healed (Fig. 9) and the patient was allowed full weight bearing. 24 months postoperatively, X-rays confirmed solid union of the atypical subtrochanteric femoral fracture (Fig.10). On recent review, the patient walks full weight bearing without the need of any support, with a normal gait and is completely asymptomatic as regards the femur as well as the jaw. Bisphosphonates are widely for the treatment of osteoporosis and reduce the overall risk of fracture among patients. However, since bisphosphonates reduce bone remodeling, they might “freeze” the skeleton, allowing accumulation of microcracks over time, leading to fatigue fractures (also called stress fractures).In bone, their appearance is characterized by a straight fracture line running perpendicularly to tractional forces. Stress fractures in compact bone occur at sites with high tensional stress, such as the lateral cortex of the proximal femoral shaft; this site corresponds to the locations of reported bisphosphonate-associated atypical fractures[2, 3].Features of minor fractures include prodromal thigh pain , cortical thickening, and periosteal reaction in the lateral cortex. Schilcher et al. assessed all hip fractures that occurred in Sweden (12,777 hip fractures, 59 AFFs). The risk of AFF, which appeared in this study to be independent of comorbid conditions and medication, increased with longer duration of use, with a 70% reduction in risk for every year following discontinuation. Dell et al. identified all nontraumatic subtrochanteric and femur shaft fractures that occurred in patients in the US. Bisphosphonates were taken by 97 of the 102 AFF patients for an average of 5.5 years. The risk of an AFF increased with duration of bisphosphonate use from 2 cases per 100,000 patient years for 2 years of treatment to 78 cases per 100,000 patient years for 8 years of treatment. ONJ is defined as the presence of exposed bone in the maxillofacial region that does not heal within 8 weeks of identification by a health-care provider in the absence of radiation therapy . Clinical signs and symptoms of ONJ include pain, swelling, paresthesias, and suppuration, along with soft tissue ulceration and intra- or extra-oral sinus tracts. Imaging studies may be normal or show radiolucencies or radio-opacities. At the present time, evidence suggests that there is a dose-response relationship between bisphosphonate use and the development of ONJ. In a survey of Canadian physicians , the cumulative incidence of bisphosphonate-associated ONJ was 0.4% for cancer patients but only 0.001% for osteoporosis patients. A Scottish survey  of 900,000 patients concluded that the incidence of bisphosphonate-associated ONJ was about 4 per 100,000 patient years. It is, thus, clear that the simultaneous occurrence of AFF and ONJ following use of bisphosphonates is rare and, that following oral bisphosphonates, is extremely rare. Afif et al. found no correlation in the simultaneous occurrence of ONJ and AFF in the same patient, though it was found in patients who received parenteral bisphosphonates. Chiu et al. reported the first case of AFF shortly after osteonecrosis of the jaw in a postmenopausal woman taking alendronate for osteoporosis. The osteonecrosis of the jaw and AFF was treated surgically, and teriparatide was administered to treat delayed union of the femur fracture. Won et al. reported the next case of AFF combined with ONJ during osteoporosis treatment with anoral bisphosphonate. Their patient developed the AFF and then developed osteonecrosis of the jaw which resolved surgically without recurrent episodes. Although ours is the third such reported case in world literature, our case is very unique in that the patient developed oral bisphosphonate-related osteonecrosis of the jaw, then developed an AFF, and then had recurrent bisphosphonate-related osteonecrosis of the jaw, and finally developed a mandible fracture. This is the only such case reported in world literature of such extensive damage in this unique sequence with Alendronate. The subtrochanteric AFF went into a delayed union but managed to unite with timely introduction of Teriparatide. While bisphosphonates are first-line therapy for osteoporotic patients, there are some rare, but serious, adverse events that have been associated with their use, most notably osteonecrosis of the jaw and AFF. When bisphosphonates are prescribed for patients at high risk of future fragility fractures, we understand that the anti-fracture benefits provided by bisphosphonates far outweigh their potential harm. However, in patients persisting with bisphosphonate therapy for 3–5 years, it is imperative to reassess the need for ongoing therapy. Patients need to be monitored regularly for symptoms such as jaw and thigh pain, and should these occur, the drug must be stopped immediately. Drug holidays may not necessarily prevent the occurrence of osteonecrosis of the jaw and AFF, as our patient had a drug holiday of 2 years. Early diagnosis and appropriate management of these “atypical” fractures is of paramount important since it helps to reduce the morbidity and mortality and thus helps the patients to lead a socially and economically productive life. Oral bisphosphonate therapy for osteoporosis can have rare but serious adverse effects which even “drug holidays” may not prevent. Vigilant patient monitoring during therapy is essential, and patients need to be specifically asked about jaw and thigh pain. One must question the need to continue therapy beyond 3–5 years, given the modern treatment options available. 1. Unnanuntana A, Saleh A, Mensah KA, Kleimeyer JP, Lane JM. Atypical femoral fractures: What do we know about them? : AAOS exhibit selection. J Bone Joint Surg Am 2013;95:e8 1-13. 2. Kwek EB, Goh SK, Koh JS, Png MA, Howe TS. 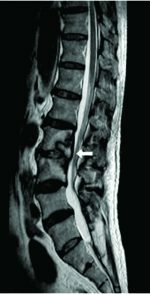 An emerging pattern of subtrochanteric stress fractures: A long-term complication of alendronate therapy? Injury 2008;39:224-31. 3. Neviaser AS, Lane JM, Lenart BA, Edobor-Osula F, Lorich DG. Low-energy femoral shaft fractures associated with alendronate use. J Orthop Trauma 2008;22:346-50. 4. Shane E, Burr D, Ebeling PR, Abrahamsen B, Adler RA, Brown TD, et al. Atypical subtrochanteric and diaphyseal femoral fractures: Report of a task force of the American society for bone and mineral research. J Bone Miner Res 2010;25:2267-94. 5. Schilcher J, Michaëlsson K, Aspenberg P. Bisphosphonate use and atypical fractures of the femoral shaft. N Engl J Med 2011;364:1728-37. 6. Dell R, Greene D, Ott SM, Silverman S, Eisemon E, Funahashi T, et al. 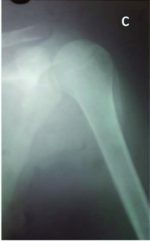 A retrospective analysis of all atypical femur fractures seen in a large California HMO from the years 2007 to 2009. J Bone Miner Res 2010;25:61. 7. Khosla S, Burr D, Cauley J, Dempster DW, Ebeling PR, Felsenberg D, et al. Bisphosphonate-associated osteonecrosis of the jaw: Report of a task force of the American society for bone and mineral research. J Bone Miner Res 2007;22:1479-91. 8. Khan AA, Rios LP, Sándor GK, Khan N, Peters E, Rahman MO, et al. Bisphosphonate-associated osteonecrosis of the jaw in Ontario: A survey of oral and maxillofacial surgeons. J Rheumatol2011;38:1396-402. 9. Malden N, Lopes V. An epidemiological study of alendronate-related osteonecrosis of the jaws. A case series from the south-east of Scotland with attention given to case definition and prevalence. J Bone Miner Metab2012;30:171-82. 10. Afif H, Mukka S, Sjödén G, Sayed-Noor AS. Do bisphosphonate-related atypical femoral fractures and osteonecrosis of the jaw affect the same group of patients? A Pilot study. Orthop Rev (Pavia) 2014;6:5067. 11. Chiu WY, Lee JJ, Tsai KS. Atypical femoral fractures shortly after osteonecrosis of the jaw in a postmenopausal woman taking alendronate for osteoporosis. J Clin Endocrinol Metab 2013;98:E723-6. 12. Won Y, Lim JR, Kim YH, Song HK, Yang KH. Atypical femoral fracture combined with osteonecrosis of jaw during osteoporosis treatment with bisphosphonate. J Bone Metab2014;21:155-9. 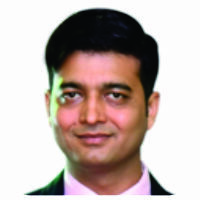 How to Cite This Article: Pispati A, Pandey V, Patel R. Oral Bisphosphonate Induced Recurrent Osteonecrosis of Jaw with Atypical Femoral Fracture and Subsequent Mandible Fracture in the Same Patient: A Case Report. Journal of Orthopaedic Case Reports 2018. May- June; 8(3): 85-88.